Chevy 2002 s-10 is the new hot rod. 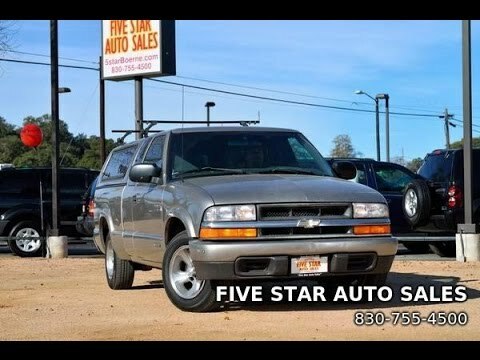 The 2002 Chevrolet s-10 is super reliable/dependable. As long as you take care of your vehicle it performs like a brand new pick-up. The inside is very nice and the center console lifts up allowing for more space inside the cab. There is also a pull down seat in the back for a small child or young adult if they can fit. When the back seat is up there is a plentiful of room, I moved myself to college in one load using this truck. The seats adjust well to the driver making for a comfortable ride. The CD player I'd definitely a plus seeing as my first 2002 vehicle had to have an inconvenient adapter. This truck has a vintage, yet sleek look that is bound to get you a bundle of compliments on your ride and ladies it's super easy to drive! 2002 Chevrolet s10 pickup four wheel drive. So my truck is a base model 02 Chevy s10 ext. cab 5 speed 4x4, great truck runs awesome, only thing I don't like as much is it doesn't have cruise control but its a base model so it's to be expected. Performance wise it tows pretty good for a little truck with a v6 and all the basic comforts such as ac and heat work awesome with the small cab. 2002 Chevy s-10. Great truck, perfect size, runs great, couldn’t be happier! My 2002 s-10 has been running great for me. Besides general maintenance needing to be done, it has been running up to my expectations. The only other issue I had was the distributor going bad but was the cheapest easiest fix anyone could ever do on a car! It has 200, 000 miles and I couldn’t be happier with its performance!